Patrick or DeAnne are available for any type of lessons you require. With over 50 years experience between the 2 of them, from the Olympic team to Molokai in double and singles, South Africa World Cups and lifeguard series racing…. Patrick or DeAnne can answer any question you may have from the basis of experience. Private lessons are $80 hour. 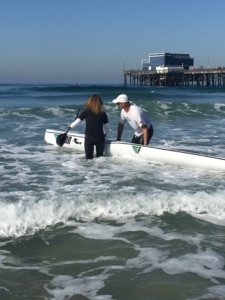 $20/hour additional if you need to rent a surfski and paddle for the lesson. Group or extended days offered in a package. Ski rental also available. $30/ hour or $50 day.